Nothing seemed wrong when Ms. Shi, a woman living in the eastern Chinese city of Yancheng, travelled abroad in an excursion organized by her company. She lived in an area due to be demolished to make way for a construction project, but talks with the local housing relocation authorities had been deadlocked for years. Before Shi had left on March 14, officials from the department courteously bade her bon voyage when hearing of her plans, the Nanjing-based Modern Express reported April 21. 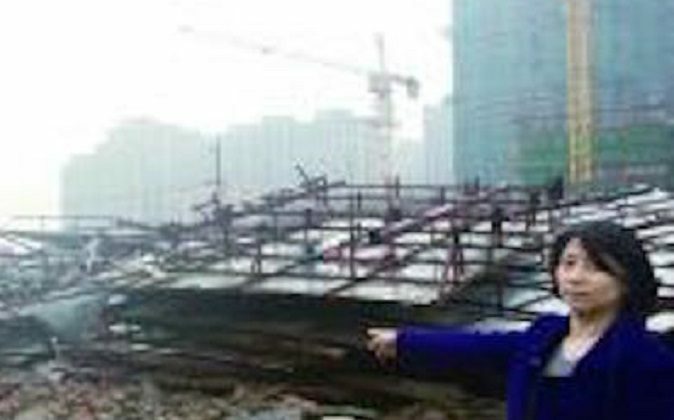 Ms. Shi returned over a week later to find that her 220,000-yuan (about $33,000), three-story home had been razed to the ground. All her furniture and belongings were gone. A visit by Shi to the housing relocation department, land developers, and local officials was inconclusive. All denied any knowledge about the demolition. Workers at a construction site near the remains of Shi’s home said that the building seemed to have been demolished on March 19. They evaded further inquiry from Shi. “We’re only responsible for construction, this has nothing to do with us,” one worker said. Chinese elites are known for their massive real estate frenzies, and cases like Ms. Shi’s are commonplace. Last December, Xu Yong, a resident of Sichuan Province in southwestern China, found his mother-in-law’s house bulldozed during the night when she was visiting a different province. Unsurprisingly, Shi suspects the relocation authorities, as she had been discussing fair compensation with them since 2012. The authorities had repeatedly tried to get her to undersell her property.